Lenstec Optical Group have introduced a Sports Rx protective range combining the very best in ergonomic design. For contact sports such as football, basketball and racket sports, where, due to different elements of the game (balls, rackets, etc.) 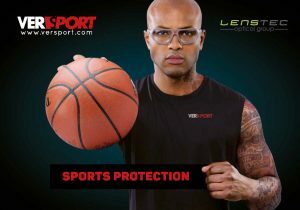 there is a risk of eye injuries, VerSport’s protective sports eyewear become essential protection equipment. VerSport eyewear offer a visual solution for every athlete; whatever their age. 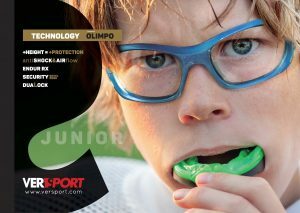 VerSport children’s frames come with a full head band fitted as standard in 46 and 49mm eye sizes, whereas the teens and adult ranges are available in three different models up to 64 eye and are supplied with super soft sides with an option to remove these sides and replace with a full head band dependent on the patients requirements, with this in mind the adult pack comes with sides fitted as standard to the goggle, rear head strap, full head band, anti-fog gel and all supplied in a protective shell case. Lenstec have the exclusive distribution of VerSport for the UK and Eire and have coupled this fantastic product offer with a full Rx program using Polycarbonate impact protective lenses to a range of +8.00 to – 10.00 with cylinders to 6.00 and at fantastic value for money. With sports such as football now enforcing the rules on non-spectacle wear and suggesting to their members a sports goggle supplied with polycarbonate corrective lenses should be worn there has never been a better time to enter the sports RX arena. There are also a number of other sports bodies who are actively seeking solutions to avoid any issues which could end up in some type of litigation, we believe the high street Optician has a major part to play in offering guidance and best advice in terms of protective/ corrective appliances for sport and play. Why not click here and download the latest VerSport Catalogue to find out more. Lenstec Optical Group are committed to help you find these solutions.